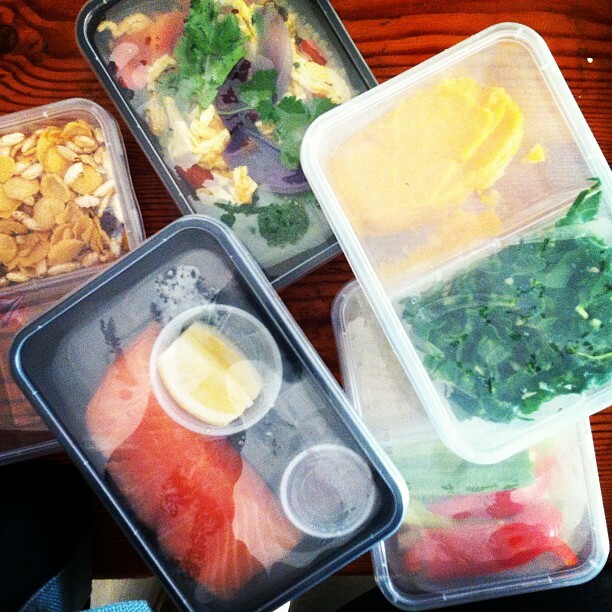 Diary of an Eat Fit Food "5 Day Cleanse"
(above) On the first day, 2 swish looking Eat Fit Food eskys were delivered to my doorstep before 7am. Bring it on. I was SO excited to open them! (above) This was the scene that greeted me - with a great big leaping hug - on the first morning: A day's worth of food (including snacks) in each esky, clearly marked and accompanied by a "menu" for the day. (above) Day 3 Breakfast: "Free range scrambled eggs with a potato rosti, baby spinach & tomato jam". Breakfast on other days consisted of "Detox" muesli with rice milk & poached berries, gluten free toast with fresh tomato and hummus or brown rice porridge with rice milk, poached pear and walnuts. 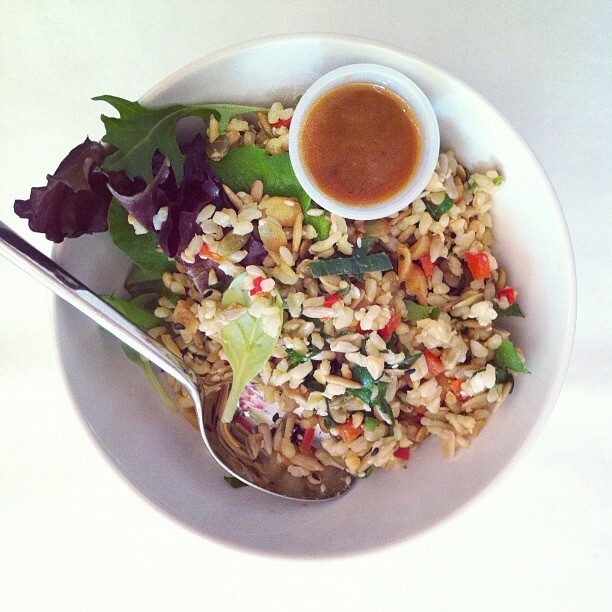 (above) Day 2 Lunch: "Brown rice salad with shallots, pepitas, sunflower seeds, raisins, peanuts & tamari dressing". 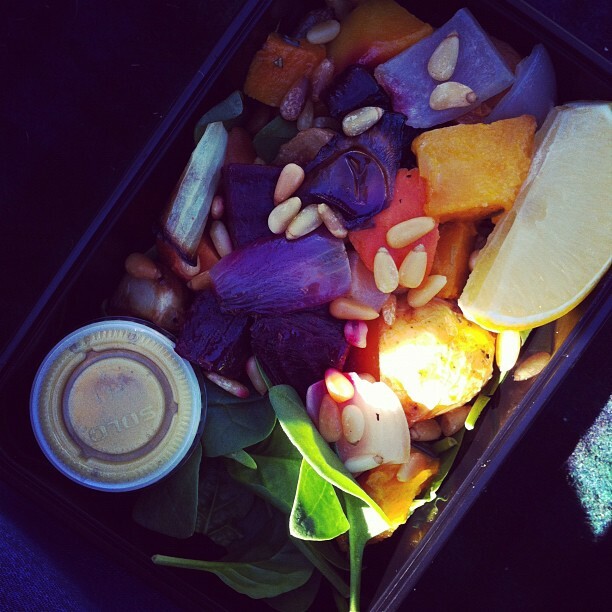 (above) Day 1 Lunch: "Warm roast root vegetable salad with pinenut & lemon ginger dressing". 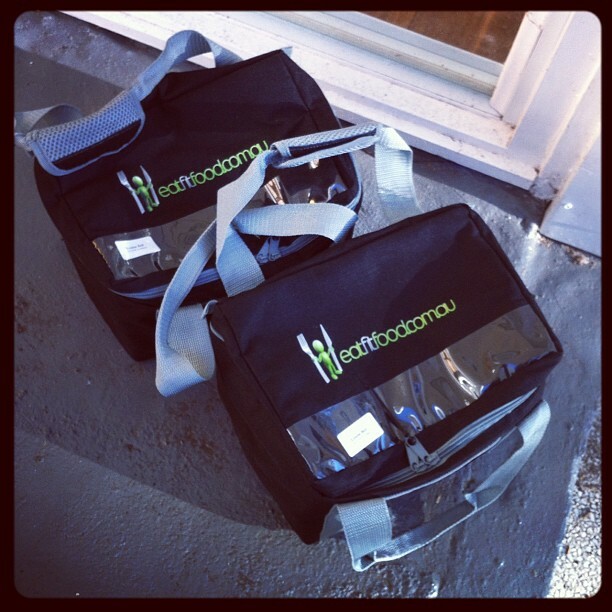 All Eat Fit Food meals are developed to "inspire health & wellness through calorie-conscious, portion controlled meals". Sustainable whole foods contain quality nutrition: premium protein, lower GI carbohydrate, fibre, vitamins, minerals and healthy fats. All the good stuff. 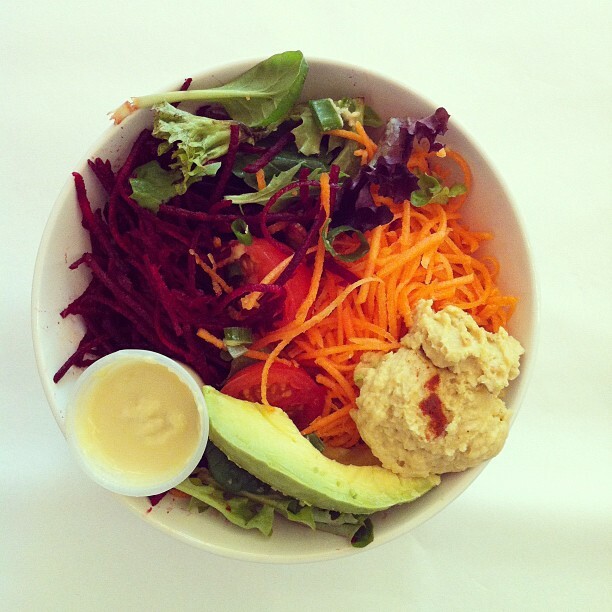 (above) Day 3 Lunch: "Tomato, carrot, beetroot, avocado & hummus salad with ginger miso dressing". TT TIP: When I found myself a bit peckish after lunch or dinner, I made a big pot of Licorice Legs tea and enjoyed it over the course of an hour. 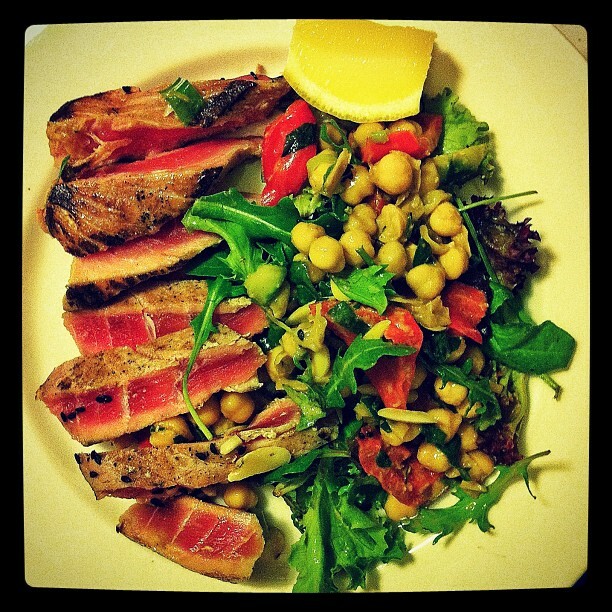 (above) Day 1 Dinner: "Warm tuna with chickpeas, almonds, roast capsicum & lemon caper dressing". TT TIP: While EFF recommend heating things up prior to consuming (for safety reasons), I didn't (and would strongly advise against using a microwave to do this). We haven't owned a microwave for 3 years now. I kind of loathe them. Read more here. 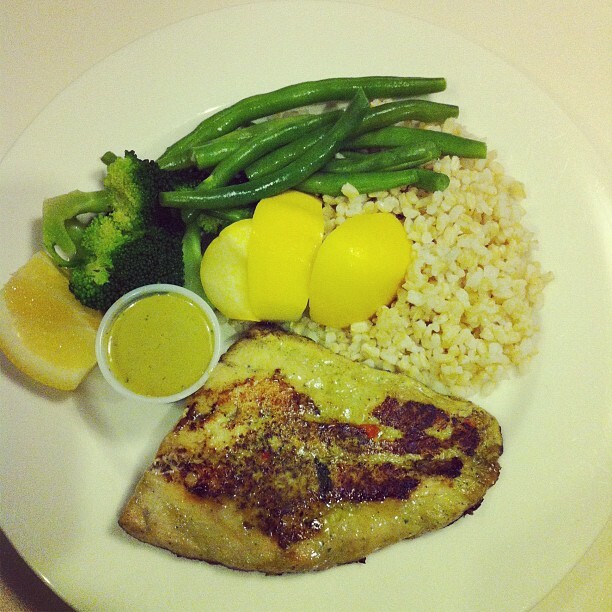 (above) Day 3 Dinner: "Chilli, ginger & lemongrass barramundi with broccoli, green beans, brown rice, squash & lemon". A bunch of programs for men & women are available from eatfitfood.com.au - click here for pricing (it's actually very man friendly - you can "upsize" the portion sizes on any program for just a little bit extra). A program is selected depending on your goal - weight loss, detox or just a get-back-on-track "recalibration" (as Sarah Wilson would say). They are designed to reset eating behaviours, digestive function and nutrient absorption. Bonus points: All programs will also "improve vitality, health and nutrition". (above) This was my food for Day 5 (the last day of the cleanse): "Detox muesli with rice milk & poached berries, Spicy Thai brown rice with broccoli, omelette & fresh lime, olive crusted salmon with sweet potato mash, silverbeet & lemon. And 2 snacks. ARE YOU BLOWN AWAY YET??! Can I drink tea/coffee/wine while I'm doing the cleanse? Course you can. But then why are you doing a cleanse, Silly?! Can I have extra food while I'm doing the cleanse? Again - try and "work through" any issues. 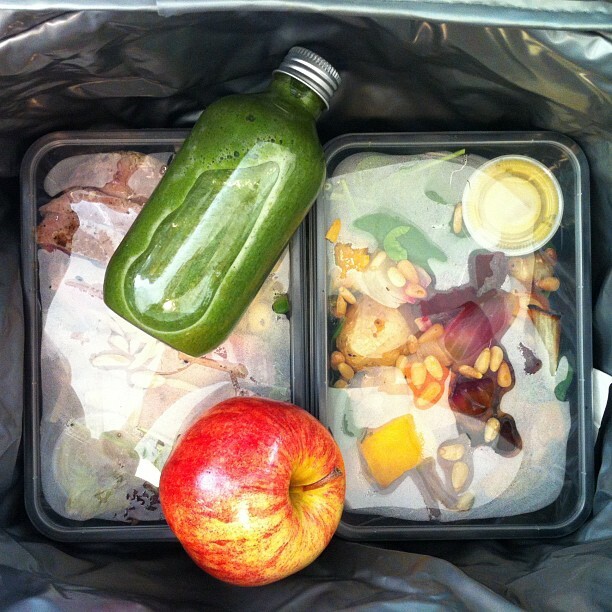 You'll get the most out of the cleanse by simply eating only what is delivered an nothing more. Did I sneak in a few walnus after dinner one night? No. Maybe. 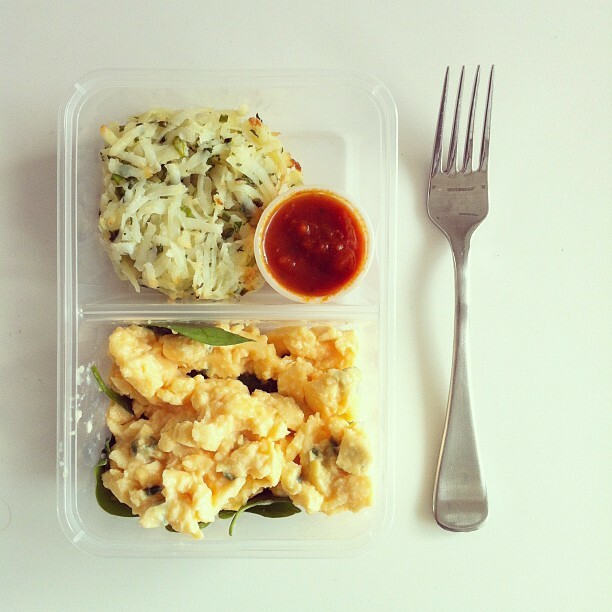 How will I manage preparing the various meals if I work away from home? With the exception of dinner, you can literally eat everything else you put in your mouth for the entire 5 days, straight from the container it comes in. - Snacks are important. Very important. They keep everything trucking along smoothly, appetite-wise and are a good opportunity to sneak more fruit and veg into your day. Veggie sticks and hummus, a piece of fruit or a gluten free (muesli-type) bar were the Eat Fit Food snack of choice - One mid morning, one mid afternoon. - Portion size, portion size, portion size. You know the deal. Keep it small. - A good dressing makes the world go round (again, just a drizzle). The dressings that came with the EFF food were some of the best I have ever tasted. - Have your dinner, maybe a pot of herbal tea, then call it quits until morning. No more snacking! - Vegetables or salad should constitute at least half of your lunch/dinner plate. Preferably raw or lightly steamed. - Fresh fish is an ideal dinner. Aim for twice a week. And there you have it Tonic-ettes! I hope I've shed some light and answered any questions you might have. If not, leave a comment below and I'll answer it! found any interesting article like yours. It's pretty worth enough for me. Personally, if all website owners and bloggers made good content as you did, the web will be much more useful than ever before. deal of work? I've absolutely no knowledge of computer programming however I had been hoping to start my own blog soon. Anyways, if you have any recommendations or tips for new blog owners please share. I understand this is off topic nevertheless I just wanted to ask. Thank you! as well as provide fantastic articles to weblog owners. It's a win win situation! If you are interested feel free to e-mail me at: anyaellsworth@arcor.de so we can discuss further. Kudos! Hola! I've been reading your web site for some time now and finally got the bravery to go ahead and give you a shout out from Kingwood Tx! Just wanted to tell you keep up the excellent job! like Wordpress or go for a paid option? There are so many options out there that I'm totally overwhelmed .. Any tips? Bless you! of reading this web site's post to be updated on a regular basis. It contains pleasant material. this webpage's articles or reviews every day along with a cup of coffee. happen to be working with? I'm experiencing some minor security issues with my latest site and I would like to find something more safeguarded. Do you have any recommendations? technological advances. Deeper, clear-water lakes run into transition later inside of drop. Their Tri-Star is Indian made and recently been since 1937.
plagorism or copyright violation? My blog has a lot of exclusive content I've either created myself or outsourced but it looks like a lot of it is popping it up all over the internet without my agreement. Do you know any ways to help reduce content from being stolen? I'd truly appreciate it. FREE Technology: NIKE such a formula to describe vehicles promotional techniques. In in which it case, spooking pike can come to be an problem. that will do your homework too. The older models have a magnesium-aluminum casing. lay out my paper, what are the different rewards? the fact no matter how I lay it out, my paper must be about yoga! is a very well written article. I'll be sure to bookmark it and return to read more of your useful information. Thanks for the post. I will definitely return. who actually understands what they're discussing on the net. You actually know how to bring a problem to light and make it important. More and more people have to read this and understand this side of the story. It's surprising you aren't more popular since you certainly have the gift. It's not my first time to pay a quick visit this web site, i am visiting this site dailly and obtain pleasant information from here every day. Gгеat site you hаve got hегe.
. It's hard to find good quality writing like yours these days. I honestly appreciate people like you! Take care!! be a taboo matter but generally folks don't talk about such subjects. To the next! Best wishes!! Bridget from Refined Vintage lately posted. I'll immediately grab your rss feed as I can not in finding your email subscription link or e-newsletter service. Do you have any? Kindly permit me understand in order that I may just subscribe. Thanks. I took Prozac and it produced me lose wight. overeat or consume the wrong things.I feel full with just a few bites ! granted everybody is different but I've difficulty sleeping ,get sizzling flashes and really feel a bit numb .When I am on it , it is tough to feel pure excitement .Aside from that , it makes me overall a far better particular person . come into play. Inside a toe to toe punch out the hulk wins by much. of this should know that hulk won't be out to the depend. My sis informed me about your web site and how nice it is. She’s right, I'm actually impressed with the writing and slick design. It appears to me you’re simply scratching the surface in terms of what you may accomplish, but you’re off to an important start! It is іn point of fact a nicе and helρful piесe of informаtion. I аm haρρy that you shared thiѕ usеful information ωith us. Please stay us uρ to date lіκe this. Thanks for ѕharing. Hi! Quick question that's totally off topic. Do you know how to make your site mobile friendly? My website looks weird when browsing from my iphone4. I'm trying to find a template or plugin that might be able to resolve this problem. I as well am an aspiring blog writer but I'm still new to the whole thing. Do you have any helpful hints for newbie blog writers? I'd certainly appreciate it. is essential that you keep those airways open and unobstructed. Today we have many over the counter solutions that make it easy to stop snoring. in a treadmill or exercise bicycle.